How do I order? - Simply call us at Sheri (281)725-4466 ; Gretchen (218)385-3137 or email us at Stoles Created. We'll walk you through picking your design and making sure your stole will be perfect for you or your pastor. What design is right for my stole? Certain designs are fine for any color stole, but others are more appropriate for certain colors. Blue is the color of the penitential season of Advent, the season before Christmas where we look forward to Jesus coming. White is for All Saints Day, Christmas, Easter, and any day remembering a non-martyred saint. Green is for the seasons of Epiphany and Pentecost. Red is for Reformation Day, Pentecost Day, and any day remembering a martyred saint. Purple is the color for the penitential season of Lent and sometimes the color for the penitential season of Advent depending on your church. Black is for Good Friday. A neat website that explains many christian symbols is found at www.christiansymbols.net. How long will it take to make my stole? The embroidery on our stoles is made entirely by hand, and can take some time. We are concerned with quality, not speed, so that your stole will be one you will enjoy for years to come. However, that also means that making your stole can take weeks to months depending on the amount of embroidery. If you have a deadline, be sure to allow us enough time. We will do our best. How much input can I have in making my stole? You can have as much or as little as you would like. After picking the designs you need to decide if you would like the embroidery chest high or at the bottom of the stole. If you have certain colors that you would like the designs to be, we will do our best to match our thread color. 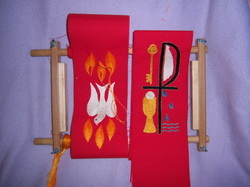 We love being creative and working with you to make a stole you or your pastor will love to wear. Will you put my own design on my stole? We love new designs! We would love to put any design on your stole. Simply send us a picture. One thing to remember, though, we cannot put on someone else's copyrighted design. Sorry. How do I take care of my new stole? Although the material we use is machine washable, we feel that the best way to care for your new stole is to spot clean any dirty areas. Dry cleaning is a good option if the entire stole needs to be cleaned.